Nigeria is not quite the most corrupt country on earth. But according to Transparency International, which monitors international financial corruption, it is not far off — coming a shameful 172nd worst among the 215 nations surveyed. Only countries as dysfunctional, derelict and downright dangerous as Haiti or the Congo are more corrupt. In theory, Nigeria’s 170 million-strong population should be prospering in a country that in recent years has launched four satellites into space and now has a burgeoning space programme. 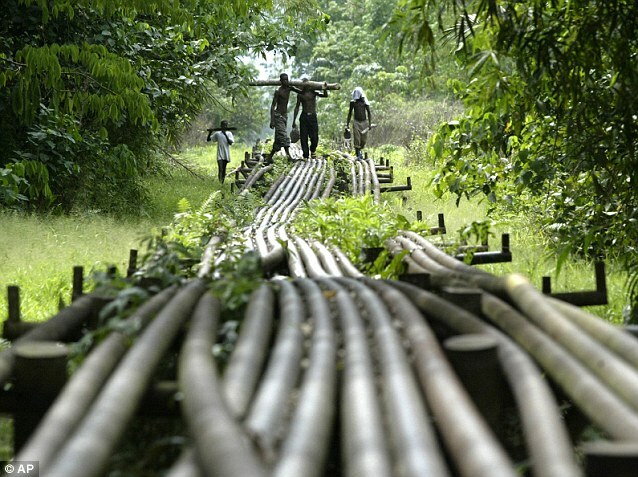 Moreover, Nigeria is sitting on crude oil reserves estimated at 35 billion barrels (enough to fuel the entire world for more than a year), not to mention 100 trillion cubic feet of natural gas. It also manages to pay its legislators the highest salaries in the world, with a basic wage of £122,000, nearly double what British MPs earn and many hundreds of times that of the country’s ordinary citizens. No wonder the ruling elite can afford luxury homes in London or Paris, and top-end cars that, across West Africa, have led to the sobriquet ‘Wabenzi’, or people of the Mercedes-Benz. 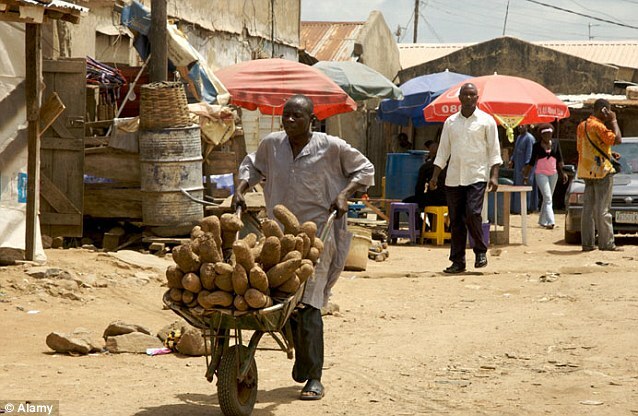 Yet 70 per cent of Nigerians live below the poverty line of £1.29 a day, struggling with a failing infrastructure and chronic fuel shortages because of a lack of petrol refining capacity, even though their country produces more crude oil than Texas. And that poverty is not for want of assistance from the wider world. Since gaining its independence in 1960, Nigeria has received $400 billion (£257 billion) in aid — six times what the U.S. pumped into reconstructing the whole of Western Europe after World War II. 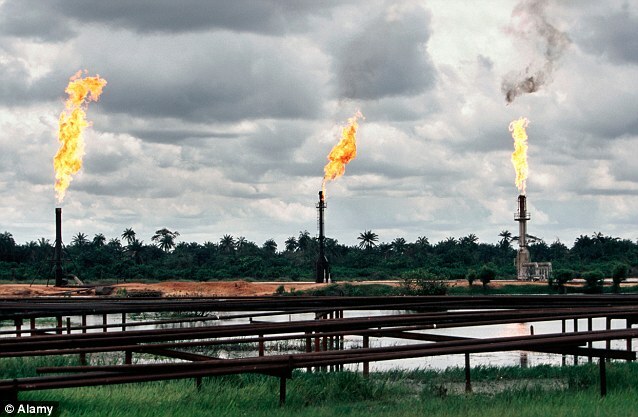 Nigeria suffers from what economists call the ‘resource curse’ — the paradox that developing countries with an abundance of natural reserves tend to enjoy worse economic growth than countries without minerals and fuels. The huge flow of oil wealth means the government does not rely on taxpayers for its income, so does not have to answer to the people — a situation that fosters rampant corruption and economic sclerosis because there is no investment in infrastructure as the country’s leaders cream off its wealth. Corruption in Nigeria is endemic — from parents bribing teachers to get hold of exam papers for their children through clerks handed ‘dash’ money to get round the country’s stifling bureaucracy to policemen taking money for turning a blind eye. It is at its most blatant, perhaps, in the oil industry, where 136 million barrels of crude oil worth $11 billion (£7.79 billion) were illegally siphoned off in just two years from 2009 to 2011, while hundreds of millions of dollars in subsidies were given to fuel merchants to deliver petrol that never materialised. Whether the country is ruled by civilians or soldiers, who invariably proclaim their burning desire to eradicate civilian corruption, it makes absolutely no difference. 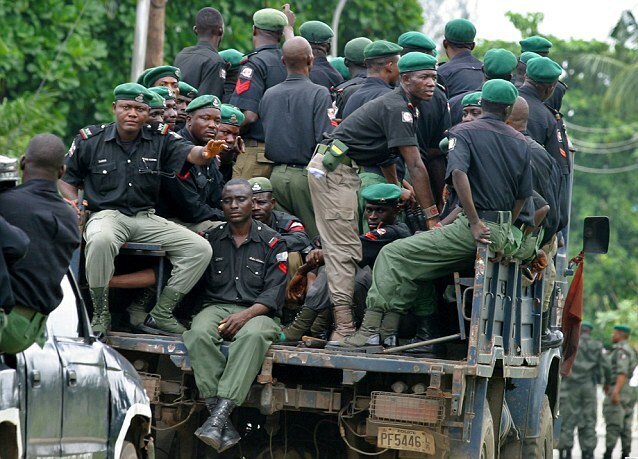 The military ruled Nigeria between 1966 and 1979 and from 1983 to 1999, but if anything, corruption was worse when they were in charge since they had a habit of killing anyone threatening to expose them. It is estimated that since 1960, about $380 billion (£245 billion) of government money has been stolen — almost the total sum Nigeria has received in foreign aid. And that even when successive governments attempt to recover the stolen money, much of this is looted again. In essence, 80 per cent of the country’s substantial oil revenues go to the government, which disburses cash to individual governors and hundreds of their cronies, so effectively these huge sums remain in the hands of a mere 1 per cent of the Nigerian population. Political power is universally regarded as a chance to reap the fortunes of office by the ruling elite and its families and tribes. The most egregious example was President Sani Abacha, a military dictator who ruled in the Nineties and accrued a staggering $4 billion (£2.58 billion) fortune by the time he died of a heart attack while in bed with two Indian prostitutes at his palace in the nation’s capital, Abuja, in 1998. 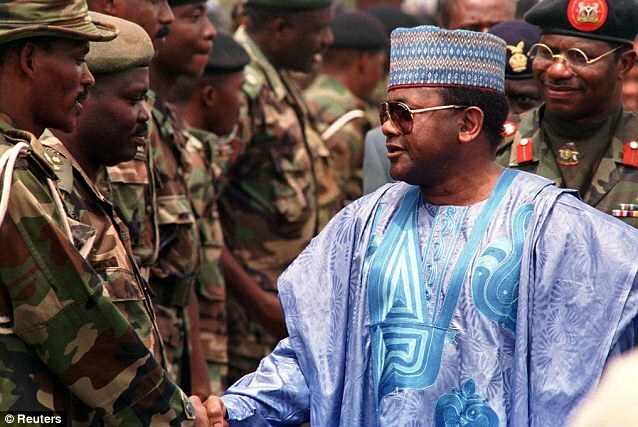 Abacha’s business associates did nicely, too — one of them deposited £122 million in a Jersey offshore account after selling Nigerian army trucks for five times their worth. Public office is so lucrative that people will kill to get it. Nigeria has 36 state governors, 31 of whom are under federal investigation for corruption. In one of the smallest states, a candidate for the governorship occupied by one Ayo Fayose received texts signed by the ‘Fayose M Squad’ — and it was clear the ‘M’ was for ‘Murder’ when they stabbed and bludgeoned a third candidate to death in his own bed. 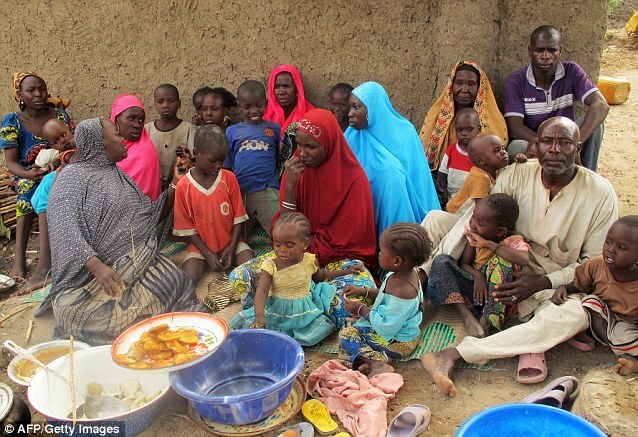 By the end of its term of office, the British Government will have handed over £1 billion in aid to Nigeria. Given the appalling levels of corruption in that nation, this largesse is utterly sickening — for the money will only be recycled into bank accounts in the Channel Islands or Switzerland. Frankly, we might as well flush our cash away or burn it for all the good it’s doing for ordinary Nigerians. Transparency International says the findings indicate a public demand for institutions and officials to be more transparent and accountable. The anticorruption group Transparency International (TI) says high levels of bribery, abuse of power, and secret dealings continue to “ravage” societies around the world, despite a growing public outcry over corrupt governments. 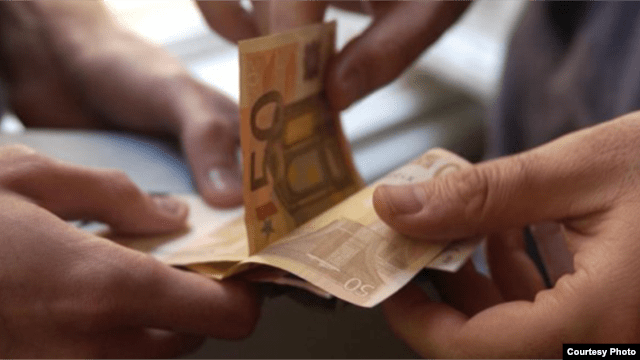 The annual Corruption Perceptions Index, published on December 5 by the Berlin-based group, shows that two-thirds of 176 countries are perceived by citizens to be highly corrupt. Transparency International regional coordinator Svetlana Savitskaya told RFE/RL the findings indicate a public demand for institutions and officials to be more transparent and accountable. She said priorities include stronger rules on lobbying and political financing and more transparency on public spending and contracting. Afghanistan, along with North Korea and Somalia, were once again at the bottom of the Corruption Perceptions Index. Russia and former Soviet republics also scored poorly – with the exception of Georgia, which showed improvement. TI says its composite index is based on data collected in the past 24 months by independent institutions specializing in governance and business climate analysis. Governments still remain inactive and still continue to act as before, and continue not to take effective measures to tackle corruption. Two-thirds of the 176 countries scored below 50 on a scale from 0 (perceived to be highly corrupt) to 100 (perceived to be very clean). “Despite the demonstrations all over the world, in many countries, which were sparked on the ground of corruption, the governments still remain inactive and still continue to act as before, and continue not to take effective measures to tackle corruption. Everywhere, even in the EU countries,” Savitskaya said. In these countries, TI says, the “lack of accountable leadership and effective public institutions” calls for a much stronger stance against corruption. Iraq and Pakistan ranked 169 and 139, respectively. Russia placed 133rd, alongside Iran and Kazakhstan. Elsewhere in Central Asia, Kyrgyzstan ranked 154, followed by Tajikistan (157), Turkmenistan, and Uzbekistan (both 170). In the Caucasus, Georgia ranked 51st, leaving Armenia (105), Azerbaijan (139) and all the other CIS countries far behind. Belarus was ranked 123rd, Ukraine 144th. Savitskaya says Georgia has introduced “robust anticorruption reforms” under President Mikheil Saakashvili, particularly in the police and education sectors. But she adds that corruption remains a big problem in the country, including in the government. THE handling of government scandals, service delivery corruption, and rampant bribery have resulted in South Africa ‘s ranking in a table of the world’s most corrupt states . South Africa dropped five places in the Transparency International corruption perception index to 69th. There are 174 listed countries. This country’s latest ranking means that it is now hovering just above the “highly corrupt” category. The Transparency International report, released yesterday, showed that the least corrupt country was Denmark and Somalia the most. The rankings range from 0 to 100. Data are drawn from independent institutions specialising in governance and business climate analysis, such as the World Bank. South Africa scored 43 points. Anything below 50 points indicates endemic corruption. Chantal Uwimana, Transparency International director for Africa, said that though South Africa, compared to the rest of Africa, was not in a bad position, perceptions of corruption had increased. “Now people believe there is a huge amount of corruption,” she said. Uwimana said the perceptions were based on corruption scandals and the perception that the government lacked resolve. Scandals that the survey would have taken into account include the handling of the case of former national police commissioner Bheki Cele and his involvement in the R1.6-billion police leasing deal, in which he was found to have acted “unlawfully”. The Department of Public Works is refusing to disclose how much money is being spent on President Jacob Zuma’s R274-million Nkandla homestead in KwaZulu-Natal. Said Uwimana: “There is a dire need for the government to take heed of warnings, especially when it comes to ensuring that the judiciary remains independent of political interference, particularly in relation to cases of corruption. “There are strong perceptions of corruption where the political elite is above the law.